In some bedrooms you don't have a lot of choice when it comes to the placement of a bed, so you might have to put a bed in front of a window. In my own house I have a room with a bed in front of the window and I'm limited in the lay out options. I have been looking for a low headboard since I think this will help create a focal point in front of the window. Another option is to add drapery panels on either side of the window – this is another common way to deal with a bed in front of the window. 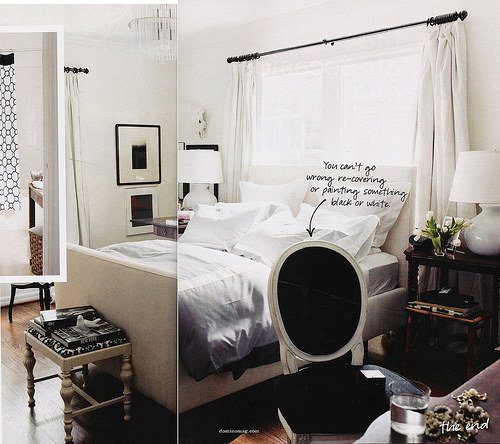 Here are some rooms with headboards and drapery when the bed is in front of the window. As you can see this really helps to frame the bed and create a nice focal point in the room.